Description: This piece is titled "Honoring The Dead." 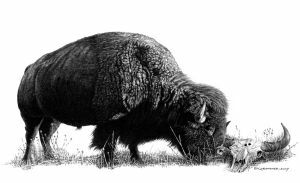 Like elephants, bison have been witnessed returning to the bones of the "fallen" to pay their respects. It is traditional oils on Ampersand Masonite "Claybord." The overall size is 24" wide x 15" high. Original sold.